[By Stephanie Bower, Seattle in Bangkok, Thailand] Sketching as a group after the Singapore symposium was almost as much fun as the symposium itself! 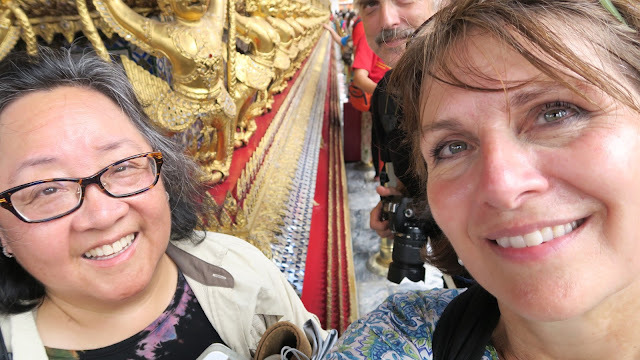 Quite a large group of us headed to Cambodia to sketch in and around the incredible ancient World Heritage site of Angkor Wat and Angkor Wat 2 (click to see posts), then a much smaller group went on to Bangkok, Thailand for a few days. Bangkok may well be the most visual overload I have ever experienced...and I've been to markets in Morocco and Mexico, temples in India...but the temples in Bangkok had something I had not expected...tons of tiny mirrored or ceramic pieces covering the intensely colored surfaces of buildings and stupas. Wow...combine that with the heat and humidity and tons of people, and we were an exhausted bunch at the end of the day. 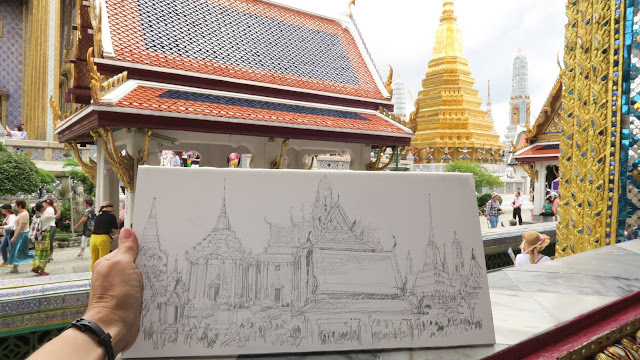 One of the temples at Wat Arun, Temple of the Dawn facing east on the river, while sitting next to Gail Wong until the rain started, so finished painting later. 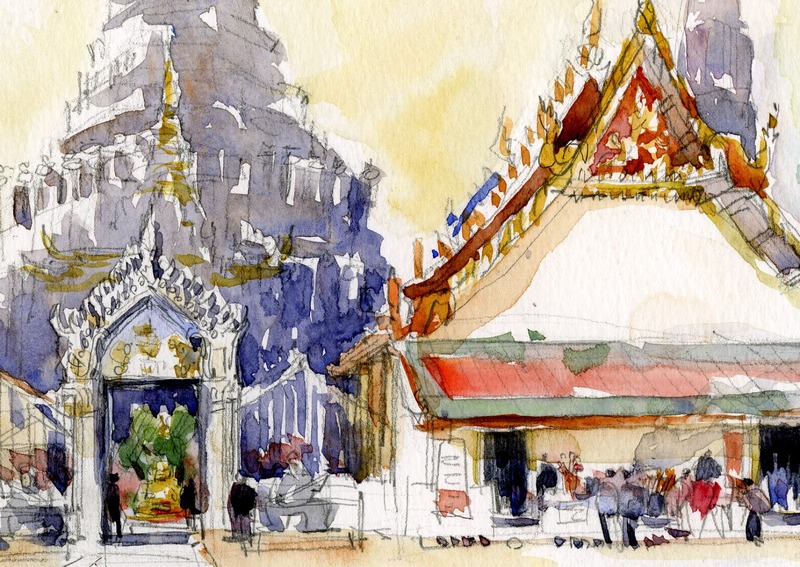 This is the main entry to Wat Arun, sketched and painted on the spot in the midday heat! The Stupa is actually covered with broken ceramic dishes that were used as ballast in boats. Detail of Wat Arun entry. A really busy view from the main temple complex in Bangkok, sketched in pencil on site then colored later. It was actually a really wide angle view, compressed a bit on the single 8" x 8" fluid watercolor block. Super intense and amazing place!! 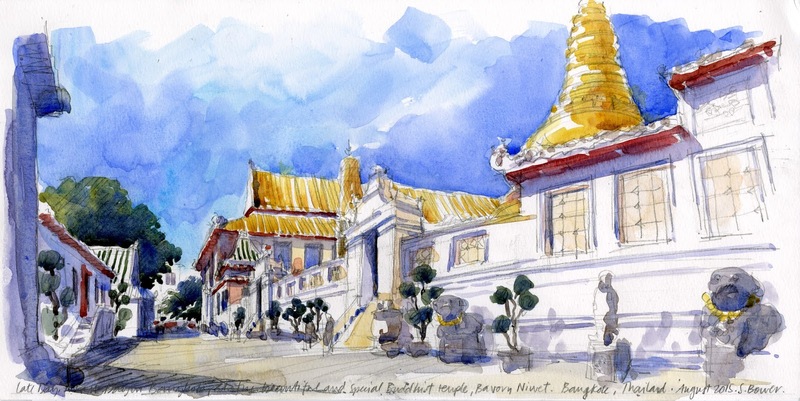 A view of probably my favorite spot, Bavorn Niwet Buddhist temple not too far from our hotel in Bangkok. This was a beautiful, serene place where we went our first night in Bangkok, which happened to be celebrating Buddha Day. I was so lucky, while sketching inside the main temple, I was invited to make an offering to the head monk...an honor I will never forget as long as I live. Thank you, Gail's TA at UW, Pomony (sp) for this amazing experience!! I encourage everyone to travel and sketch with a friend or even a group, before or after the symposium...it is amazing fun and you'll see and do things you would never otherwise experience!! !